To compute the space averaged velocity ū and pressure p̄, equations for these quantities are needed. These equations have to be derived from the governing equations for u and p̄, i.e. from the Navier-Stokes equations. The simple approach consists in applying the filter which defines (ū, p̄) also to the Navier-Stokes equations. 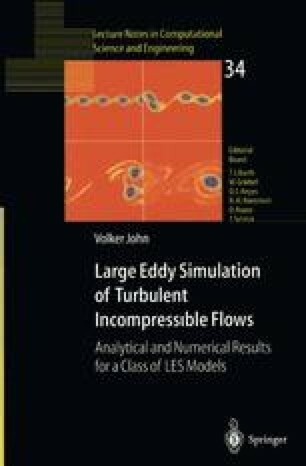 Then, under the assumption that differentiation and filtering commute, the basic equations of LES, the space averaged Navier-Stokes equations, are obtained. However, it turns out that an additional modelling step is necessary to derive equations for (ū, p̄) from the space averaged Navier-Stokes equations. This modelling step is discussed in Chapter 4.